“This is how one should regard us, as servants of Christ and stewards of the mysteries of God. 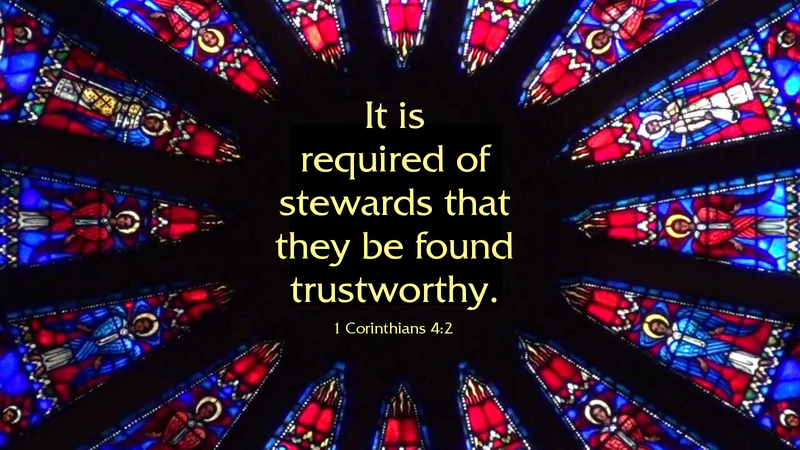 Moreover it is required of stewards that they be found trustworthy” (1 Cor 4:1-2). Most of us like to think of ourselves as “servants of Christ,” but how often do we consider what it means for us to be “stewards of the mysteries of God”? Interesting to note that in the early Church, “the mysteries” was another name for the sacraments. The word sacramentum was the translation of the Greek mysterion. While Paul in this chapter of his letter to the Corinthians is not speaking specifically about the sacraments, he is challenging the leaders of the Corinthian congregation, telling them that they are not trustworthy stewards of the mysteries of God. Later, in his Corinthian correspondence, Paul does indeed deal with the implications of this when it comes to the Lord’s Supper, and the abuse of the sacrament by un-Christian behavior. Are we trustworthy stewards of the mysteries, the Sacraments of God? What might that mean for us, today? Certainly, it would mean we care for them, protect them, and use them faithfully and reverently. Lutherans have historically made it a matter of great concern that we are trustworthy stewards of the mysteries of God. We have taken Holy Baptism seriously, with instruction for those preparing for Baptism, emphasizing the responsibilities of parents, the newly baptized, and the whole congregation as we welcome those who are born anew by water and the Spirit. With regard to the Lord’s Supper, we have sought to show great reverence and care as the altar guild prepares the holy things, as we celebrate the Liturgy of the Lord’s Supper and as we come forward to receive. Some might find our reverence and respect for the Lord’s Body and Blood somewhat antiquated and out-of-place in our casual, comfortable twenty-first century world. And yet, what else would it mean to be trustworthy stewards of the mysteries of God? Because God entrusts His incarnate presence to us in Word and Sacrament, we want to be found trustworthy as we are stewards of these things! Prayer: Lord God, help us to show respect and reverence to your incarnate presence with us in Word and Sacrament, that we may be trustworthy stewards of your mysteries; through Jesus Christ our Lord. Amen.